One in long series of promotional postcards used to dun clients. Having invested a great deal of energy in making a witch and candy models for Gingerbread Tenement, it seemed expedient to get a second use out of them. 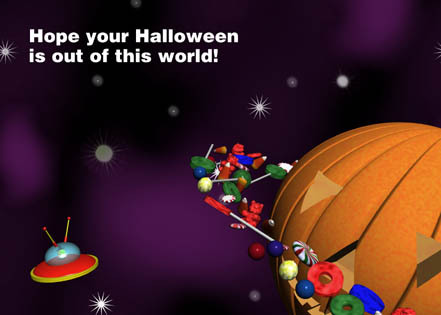 Thus, the candy was sent to orbit a pumpkin Saturn and the witch was plopped in a flying saucer. No injuries were sustained while straining this particular metaphor.